Home / Business / The Official Anglotees Black Friday / Thanksgiving Week Plan – Please Read for Details! 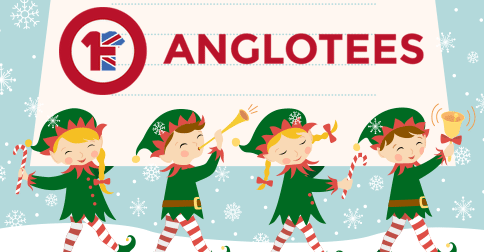 The Official Anglotees Black Friday / Thanksgiving Week Plan – Please Read for Details! It’s our favorite time of year – the holiday season and it’s also the first time we’re run a retail business for Christmas. Our business model is rather challenging to market around Christmas as the lead time for an order from us is 2-3 weeks, so pretty soon there will be a cutoff for Christmas ordering to get them in time. Next Friday is known at Black Friday here in the USA – it’s the day after Thanksgiving and the biggest shopping day of the year. As with everything we’ve done so far, we have a plan. Here’s a breakdown of what you can expect next week. We will issue a coupon code for an order discount that will be good from Thursday to Monday (Cyber Monday). We haven’t decided the amount of the discount yet but it will me more than the usual coupon included with all our orders. Customers will be notified by email and across all our social media channels. On Wednesday, we will launch probably our final remainder sale of the year. This one will be HUGE. We have over 100 leftover t-shirts to sell and will probably have more by the time we launch the sale. Remainder shirts are first come, first serve and they’re usually gone within 24 hours. So, look out for the Facebook post or email announcing this. Fast fingers will be needed! We will continue our normal shirt launch schedule, which is new designs every Friday at Noon US Central Time. We’ll have 3 new designs on Black Friday. These will probably be the last designs that will comfortably make it for Christmas deliveries. We’re still working on the details but we will offer some sort of gift certificate program where you can buy someone an Anglotees gift certificate. This year they will be DIGITAL ONLY. You’ll get a PDF you can print off or email that will have all the details. We looked into getting physical gift cards but it’s beyond what we’re capable of offering at this stage. USA orders ordered during Black Friday weekend should arrive by Christmas. International orders MAY arrive by Christmas but we cannot guarantee it so please do not order if you need it for Christmas and you live outside the USA, we do not want you to be disspointed if it doesn’t arrive. After the Black Friday designs, the new weekly shirts will NOT arrive in time for Christmas for anyone, so do not order them as gifts. We will be repeating this message a lot so people don’t end up disappointed. We plan to have our new designs as usual throughout December. The week of Christmas, we plan to do something special. And then we have HUGE things planned for 2015. That’s all we can say at this stage. Previous post: Video: History of the Routemaster London Bus – Our London Bus Shirt Returns for Limited Christmas Run – 72 Hours Left to Buy!